Getting there: From IH-35 in Round Rock, head west on RR 620. Turn right onto Great Oaks Drive. 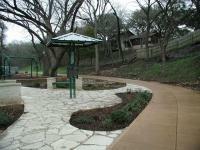 At the intersection of Great Oaks and Brushy Creek Road park in the spaces available in the southwest corner. Several kiosks and signs along the trail provide an historical overview of early settlers to the area. 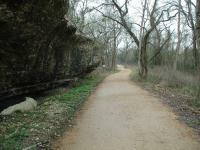 The Hike: The Brushy Creek Regional Trail is more than just Williamson County's answer to Austin's Town Lake hike and bike trail. 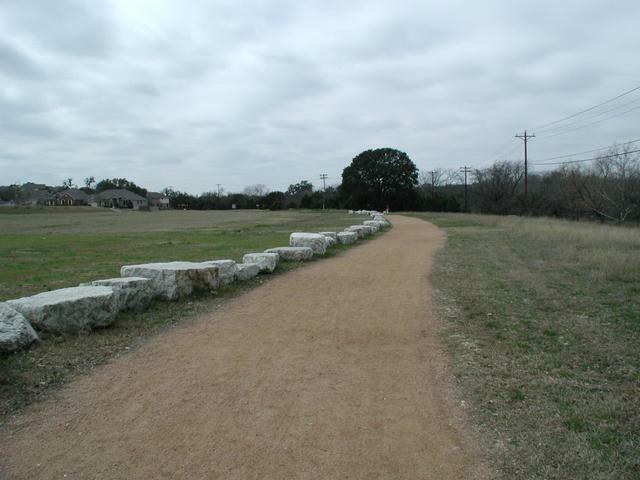 While currently a mere 2.5 miles on way, the trail as it exists today is only a small portion of a grand plan to create a connected trail system that will create a web of mobility and recreation from one end of Round Rock to the other, and eventually extent to the boundaries of Williamson County. The official City of Round Rock long range plan is available online. 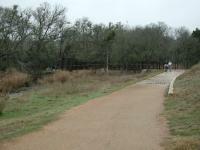 The trail has multiple trailheads along its length, typically, just off of Brushy Creek Road. On the topo map the waypoint "Trailhead" marks the most common starting point on the trail, just before Great Oaks crosses Brushy Creek. Click on the topo map above for the larger map that shows the actual regional trail in a red track and trails in adjacent parks are shown in blue tracks. The trail parallels Brushy Creek and the road that bears its name for most of its length. The trail surface is crushed granite with the exception of a few spots of pavement here and there. 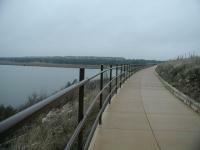 With the exception of the switchback to get to the top of Brushy Creek Lake Dam near the trail's end, the path is almost perfectly flat and level. It parallels South Brushy Creek from start to finish and mostly parallels Brushy Creek Road. The cars driving by on the road cut solitude to almost nil along most of the trail, but one can find a quiet spot or two, particularly on the western half of the trail when it separates from the road. The crushed granite path crosses streams a couple of times over bridges, such as this one. At several spots along the trail interpretive markers have been placed to add and additional dimension to the trail. Stories of early settlers and prominent families provide some insight into what the area was like before it became suburbia. The trail even passes right by a small family cemetery, marked on the map by the waypoint "Cemetery". 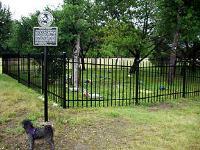 The Champion family laid their dead to rest here between 1862 and 1909. 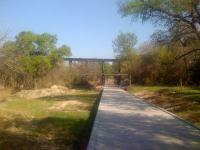 Brushy Creek Regional Trail is a fine place for walking, running and biking. Though it doesn't provide a more serious hiking experience, the promise of an artery of trails spreading like a web throughout the area is an exciting and I, for one, can't wait to see it grow. Coppertone and I walked the western portion of the trail that we had not yet mapped out. The western path we hiked is all paved and makes for easy walking. Though not a tough hike by any means we experienced an equipment malfunction that had us making decisions on how to proceed. Coppertone's boots started to come apart as the soles separated from the boot. Her boots were old, but we had no warning that they were on their way out. Halfway through the hike she removed one, then both soles and walked the rest of the way in the boots with no souls (soles). At times we planned how to have me walk back to the car and pick her up, but she made it all the way back. Our first stop after the hike was to REI to purchase a new pair of boots. REI was kind enough to let her wear the boots out of the store. I headed out today to map the newer section (well, new to me) of the trail east of Great Oaks Drive and some of the feeder trails that link with it. While I was at it I also logged about 6 geocaches along the way. The trail is almost all paved, save for a small segment here and there that is gravel or hardpack. This is really a hike and bike trail and not a hiking trail. I got a chuckle out of the parents warning their children to get away from the high grass on the edge of a field on which they were playing because there were snakes in there! What a wonderful way to imprint negative views of nature on your kids by scaring them with exaggerated tales of anything not managed and manicured. Just great. We walked from Great Oaks to the Dam. It was okay but so close to the road. It does head further east and to a big park west of the dam. I'd love to come back with my bike, and this would be great for runners and families. I didn't enjoy it much for a hike. Walked this trail this morning from 10:15-11:45. 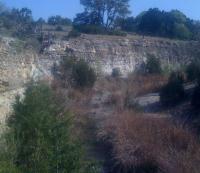 My dog and I walked from Creekside trail head to the middle of the dam. It was a pleasant walk with nice shade and nice people. They provide poop bags but not so many garbage cans. There are a lot of emergency call boxes if something should happen. There were quite a few bikers but were good about calling out their position. Bring your own water and wear sunscreen. There is shade but for long streaches you'll be exposed to direct sun. Parts of the trail run parralles to CR 174 so you'll not feel very secluded but the scenery will compensate for the traffic noise. 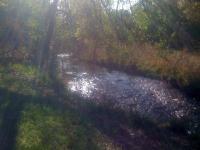 I look forward to walking my dog there again soon!